Inveneo launched the Bati Anfòmatik Teknisyen yo ak Inveneo (BATI) Program to train and certify rural Haitian IT entrepreneurs to deploy and support a high speed, broadband wireless network in rural population centers across Haiti. BATI participants are rural youth who have experience in information technology and an interest in becoming entrepreneurs. Through the BATI program, Inveneo trained youth in the technical skills needed to deploy broadband and computers in rural areas, and how to run their own ICT businesses, graduating 64 new Haitian ICT entrepreneurs. To help jump-start their businesses and provide support to the broadband network, Inveneo brokered meetings between the newly trained ICT entrepreneurs and local ISPs to create partnerships to expand the broadband network and serve rural clients. The match-making was a success – the network, supported and deployed by Inveneo-trained ICT entrepreneurs, now provides access to broadband Internet to over 20% of the Haitian population, ensuring that rural schools, healthcare centers, non-profits, and enterprises can help Haiti build back better after the devastating earthquake. Yet, training and business leads alone do not create sustainable entrepreneurs. Long-term mentorship is crucial for entrepreneurs to survive and expand in the competitive ICT marketplace and in Haiti’s under-developed business climate. To help the entrepreneurs, Inveneo launched a partnership with MicroMentor in May 2011 to build a mentor-support network for the business aspects of the BATI program. Since the program’s inauguration, 46 Inveneo-trained BATI entrepreneurs, representing 72 percent of the entrepreneurs trained by Inveneo in Haiti, have joined the program as entrepreneurs seeking advice from seasoned businesspeople. Twelve local Haitian business professionals and staff of Inveneo Certified ICT Partners (ICIP) around the world have signed up as mentors to provide advice to the entrepreneurs, resulting in a total of 26 mentoring relationships. BATI entrepreneurs use the MicroMentor website to find and engage with professional mentors. In addition, the BATI entrepreneurs can pose specific questions related to their businesses and mentors can post responses, starting a dialogue that can be viewed by all entrepreneurs. There are also groups where members are able to participate in discussions and find resources specific to their program, such as Inveneo products and business plan templates. «Je profite encore de vous féliciter pour ce programme, il est vraiment utile à tous ceux qui font partie et il porte du succès dans leurs entreprises » – I would like to again take this opportunity to thank the program; it is truly useful for everyone and the help that is needed to create a successful business. « Nous avons beaucoup parlé de mon business, et elle m’a donné des bons conseils. » – We have spoken a lot about my business, and [my mentor] has given me a lot of great advice. Overall, the program has been very successful in supporting Inveneo-trained entrepreneurs. The ultimate gauge of its success will be the number of entrepreneurs whose businesses survive the crucial first two years of operations. 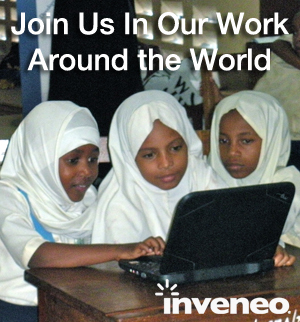 Beyond Haiti, one of Inveneo’s aims over time has been to promote and strengthen collaboration among Inveneo Certified ICT Partners in the twenty plus countries in which they work. This initiative is our first opportunity to build collaboration among the francophone countries of Africa and with Haiti. Through MicroMentor, we are beginning to see trans-Atlantic mentoring matches being formed, and are very excited about the potential impact. Inveneo partners can now support one another and share their expertise. They may be small businesses, but we see big impact in reaching our ultimate goal of improved ICT entrepreneur economic self-sustainability. On a sunny morning, BATI (Bati Anfòmatik Teknisyen yo ak Inveneo) participants reached an important milestone as they looked out over the hills of Pétion-Ville: the BATI Forum. This was the first major national meeting of the members of the program. Its goal was to give an overview of efforts of their colleagues across Haiti – and to coordinate them. Nineteen BATI technicians from four different regions of the country attended the inauguration of the Forum on November 15 at the new headquarters of Inveneo Haiti in Juvénat, a suburb of Port-au-Prince. Until that point, a total of 36 BATI members had been trained, and since then another 15 participated in a training in Cap Haïtien. The expansion of BATI personnel is assuming a growing importance for the continuity of the Haiti Connected Cities program with the approach of Inveneo’s depart from Haiti, projected for April 2012. Inveneo is a non-profit social enterprise whose mission is to get the tools of information and communications technologies into the hands of organizations and people who need them most, and which has worked in Haiti since the January 12, 2010 earthquake. The assembly was organized by Emmanuella Stimphat, CEO of Connet’Em and BATI for Grand-Goâve, and Jerry Joseph, CEO of JigabIT Plus and BATI for Léogane. The opening presentation of the event was made by FJ Cava, Director of the BATI program at Inveneo, after which Ralph Étienne, CEO of Central Point Inc. and BATI for Mirebalais, gave a brief overview of the day’s program. Each BATI presented a “sound byte” on his or her role in their territory and their small business. The participants had the opportunity to share their experiences and also pass on their complaints. They also learned important new skills from Inveneo technical volunteers Eyleen Chou and Andrew Dupree. Distinguished guests, Mr. Jonas Dumersain and Mr. Yves-Fils Stimphat spoke about accounting and legal issues, respectively, which provoked stimulating discussions. The participants also set in place standards for identifying themselves to clients and each other such as standard IDs and uniforms, registration with the Haitian Chamber of Commerce and a diagram of the board of management. Overall, the gathering provoked a range of discussions on the big picture of the organization and functioning of the BATI program. Un matin ensoleillé sur une terrasse qui donne sur les collines de Pétion-Ville, le programme Bati Anfòmatik Teknisyen yo ak Inveneo (BATI) a atteint un jalon important : le Forum BATI. C’était la première grande réunion nationale des cadres du programme, avec le but de donner une vue d’ensemble des efforts de leurs collègues à travers Haïti — et de les coordonner. Dix-neuf techniciens BATI de quatre différentes régions du pays ont assisté au lancement du Forum le 15 novembre au nouveau siège d’Inveneo Haïti à Juvénat, une banlieue de Port-au-Prince. Jusqu’au moment, un total de 36 cadres avaient été formés, et depuis ce temps-là à peu près 15 davantage ont participé dans une formation à Cap Haïtien. L’augmentation du corps de personnel de BATI prend une importance croissante pour la continuité du programme « Haiti Connected Cities » à l’approche du départ d’Haïti d’ Inveneo, prévu pour avril 2012. Inveneo est une organisation non-gouvernementale dont la principale mission est de connecter les plus nécessiteux à Internet, et qui a travaillé en Haïti depuis le tremblement de terre du 12 janvier 2010. La rencontre a été organisé par Emmanuella Stimphat, PDG de Connet’Em et BATI de Grand-Goâve, et Jerry Joseph, PDG de JigabIT Plus et BATI de Léogane. L’intervention introductive de la réunion a été faite par FJ Cava, Responsable du programme BATI à Inveneo, suite à laquelle Ralph Étienne, PDG de Central Point Inc. et BATI de Mirebalais, a fait un “briefing” du programme. Chaque BATI à son tour a présenté son “sound byte” sur sa rôle dans leur zone d’activité et sa Petite ou Moyenne Entreprise (P.M.E). Ce fut également l’occasion pour eux de partager leurs expériences aussi bien que communiquer leurs doléances. Ils ont aussi fait le point sur des matieres élucidés par Eyleen Chou et Andrew Dupree, deux bénévoles techniques d’Inveneo. En outre, des invités de marque, tels que M. Jonas Dumersain et M. Yves-Fils Stimphat ont apporté des conseils d’or et des principes dans différentes disciplines. Les participants ont aussi mis en place des normes sur comment s’identifier aux clients et aux autres BATI tels que des cartes d’identité et des uniformes, la registration avec la Chambre de Commerce d’Haïti, et un diagramme du conseil de gestion. En somme, la rencontre a occasionné tout un panel de discussions concernant grosso modo l’organisation et le fonctionnement du programme BATI. Just 9.6% of the total population in Africa has access to the Internet. This is less than 1/5th and 1/6th of the rate in the Americas and Europe, respectively. But this statistic does not convey the real situation in the world’s poorest countries. Of Africa’s 48 sub-­Saharan countries, 29 (60%) have total Internet usage rates (at any speed) of less than 3%, and 15 (31%) show less than 1%. Broadband access rates are far lower still. Inveneo believes that closing the broadband gap will require new, collaborative and low-cost broadband service delivery models. Moreover, we believe that the essential components of such a model already exist; what’s needed is a well-conceived and coordinated effort to bring them together in a functioning service delivery framework. 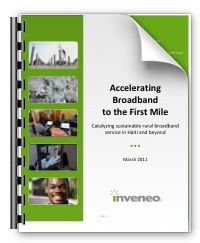 In the Accelerating Broadband to the First Mile white paper, Inveneo and our partners are working to define and deploy a novel, locally sustainable wireless broadband delivery model, starting in Haiti. The Inveneo­-led Haiti Rural Broadband (HRB) initiative is a collaborative program seeking to catalyze sustainable broadband access in underserved parts of Haiti. The program is founded on the idea that dramatic capital and operating cost savings can be realized through the use of ultra-low-cost wireless technologies, an emphasis on building local IT capacity to deploy and support broadband infrastructure and new approaches to cooperative network ownership and management. 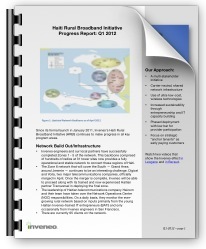 HRB’s primary short-term objective is to bring affordable, reliable and sustainable broadband access to 6 regions and 20 currently un-served population centers across Haiti. The longer-term goal is to explore how the HRB model can be replicated in similarly rural and low resource areas across the developing world. Inveneo recently completed its first BATI training (Bati Anfòmatik Teknisyen yo ak Inveneo) in Mirebalais, Haiti on March 18, 2011. After a week of classroom and hands-on training modules, 11 participants graduated as certified BATI IT technicians. The BATI training had a big impact on the technical interns in helping us get started in the IT markets of Haiti. It helped us perfect our skill by teaching us technology philosophy, its practical usage, and simulations of real-world events. It was also taught in both Creole and French which was greatly appreciated. One key objective of the BATI program is to address the problem of chronic unemployment among Haiti’s youth through entrepreneurship opportunities. Of the 15 participants who started the BATI training, 11 were unemployed at the time, yet all had graduated high school. Inveneo will continue to train candidates in other provinces of the country, covering 22 communities across six regions. The BATI program strives to deploy connectivity through an entrepreneurial model that will reach and serve clients (schools, NGOs, enterprises and others) with cost-effective Internet. 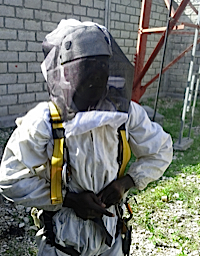 Each BATI IT technician will work on connectivity and computing support issues with network subscribers, largely nonprofit and community groups throughout Haiti. They will operate as independent consultants, earning revenue from installation and support contracts. Deploy new, relevant technology in education to increase ICT knowledge and usage.